Posted in Uncategorized	by Sarah H.
Orange, and then Yellow and we are on Green. I looked forward to this week because I really like green and there are TONS of books that work with this theme. This is a great storytime book! It has a lot of momentum and tons of repetition so the children really get into it. Ok, I totes stole this one from Storytime Katie’s Green Story time. It’s a storytime classic and so much fun. I had honestly forgotten about it and was really glad when her storytime reminded me of it! I recently made this into a flannel board! Hooray! Here is a link to the template I used: Kizclub.com’s Big Green Monster Template. I will be honest, I found it because of Storytime Katie’s blog. Credit where it’s due, folks! Anyway, this flannel board is super popular with the kids and they asked for it again and again! It went really well. Green is an awesome color and there are tons of great books that fit this theme. The kids were super receptive and especially loved The Croaky Pokey and Go Away Big Green Monster. I am really still trying to catch my stride with this. With such large numbers of children and just a few adults, it’s been a challenge to find anything that works really well that isn’t just coloring pages. There is a huge difference between what a 3-year-old with an adult and a 3-year-old by themselves can handle. 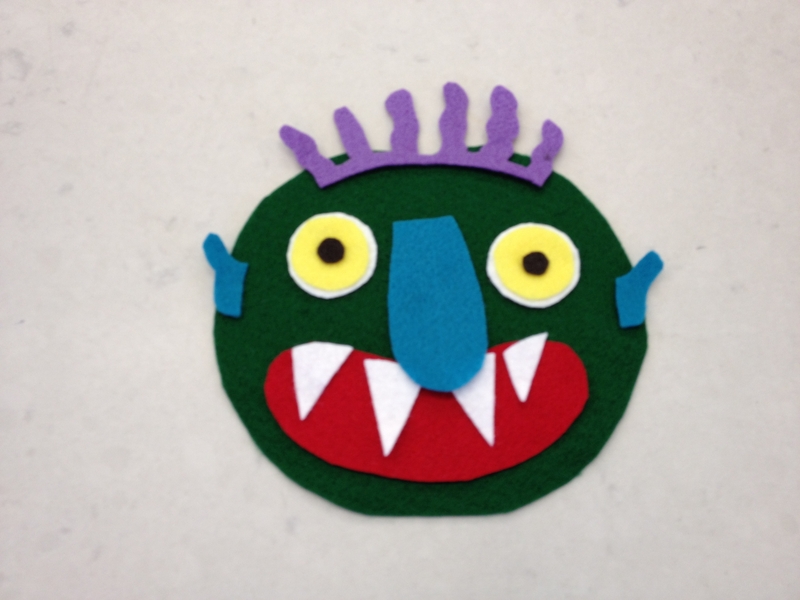 This week’s craft was inspired by The Croaky Pokey. We made frogs! 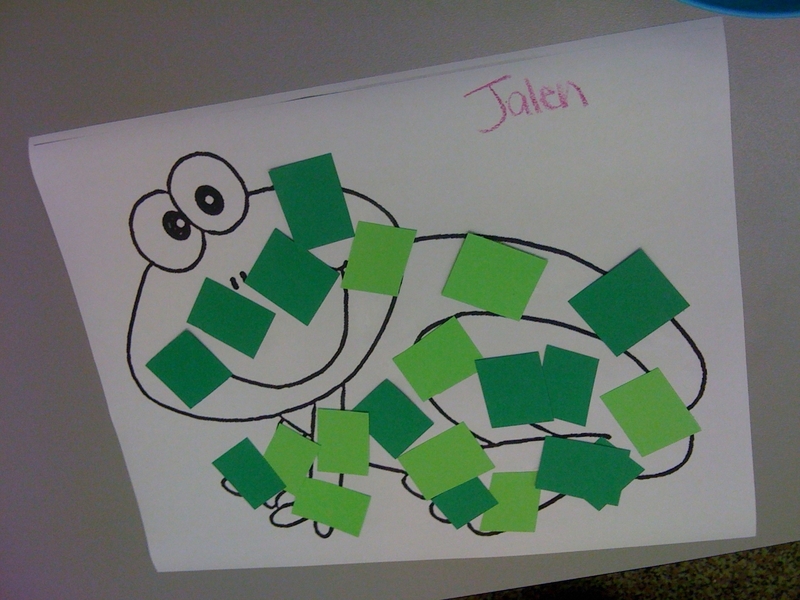 I gave each child a frog outline and they glued the green squares inside. It worked really well. For a lot of the children, this was one of the first times they have ever used a glue stick. We did have some messy fingers but it was a lot of fun! I think I would use this again and give the kids more color choices. Usually I am all about letting them express themseves but since our theme was green we just used the green squares. I should have used “Snip Snap!” I love that book, but have never used it in storytime!